Each February and August, thousands of fashion industry professionals converge upon Las Vegas for WWDMAGIC and its various trade shows. It's during this time that Fashion Snoops sets up its trend gallery in the Sourcing area. They also host a trend forecasting seminar to a growing group of designers, buyers, retailers, bloggers, and students who are hungry for their fashion forecasts. Since I have both a passion and background in trend forecasting, their presentation is the most anticipated event of the week for me. Each season, they select four trends, and they go into detail describing the inspiration, key garments, fabrics, colors, and silhouettes for each trend. Didn't get a chance to attend the seminar or visit their trend gallery and see their fall/winter 2013/2014 trend forecast? Want to know what they're forecasting for a year from now? Here's a recap of their four trends. 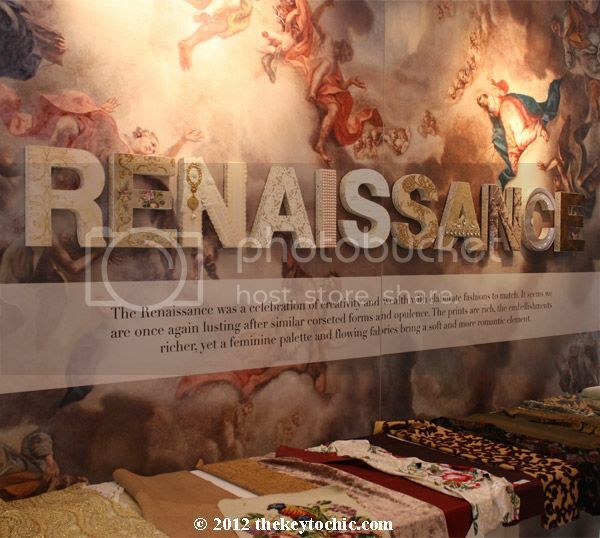 First up is Renaissance, which they describe as "a celebration of creativity and wealth with elaborate fashions to match." This trend is inspired by opulent Renaissance paintings, and is characterized by rich prints, richer embellishments, a feminine palette, and flowing fabrics. Plush fabrics, tapestry prints, and medallion patterns are key to the trend. Fabrics include: jacquard, velvet, taffeta, and punched suede. Key garments are the fit-and-flare dress (this one is gorgeous), flared burnout pants, the embellished mini skirt, and the needlepoint pullover top. 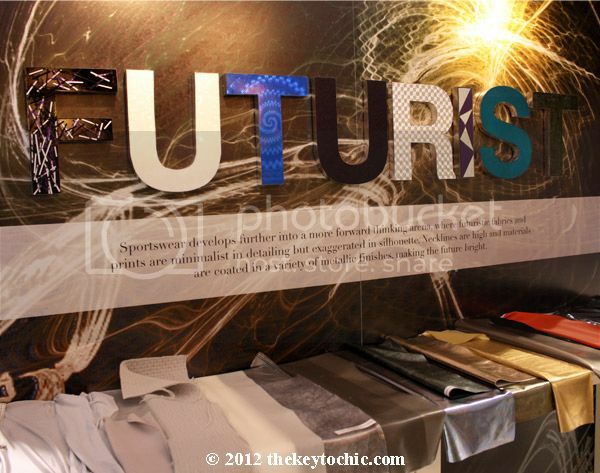 Futurist is the theme of the second trend. It includes sportswear with futuristic fabrics, "minimalist in detailing, but exaggerated in silhouette." High necklines are key, as are metallic finishes in shades of silver and gold. Peplums, color blocking, and sporty fabrics are significant to the trend. Expect to see galaxy prints, sci-fi motifs, sequins (like on this blouse), sheer details, lucite, and mesh. Sculptural footwear is important, as are shift dresses and tailored jackets with strong shoulders. The third trend is the most intriguing to me and it's called Dark Romance. It has both a feminine edge and a hard edge mixed into one. It's more rocker-inspired, mysterious, and moody than the Renaissance trend. It "dilutes tough elements like leather and hardware with wispy, flowing fabrics and touches of color." Key fabrics include lace and velvet, while Gothic undertones and religious symbolism are seen in prints and embroidery. Studs, crosses, brocade, deep florals, and dark colors are essential elements of the Dark Romance trend. 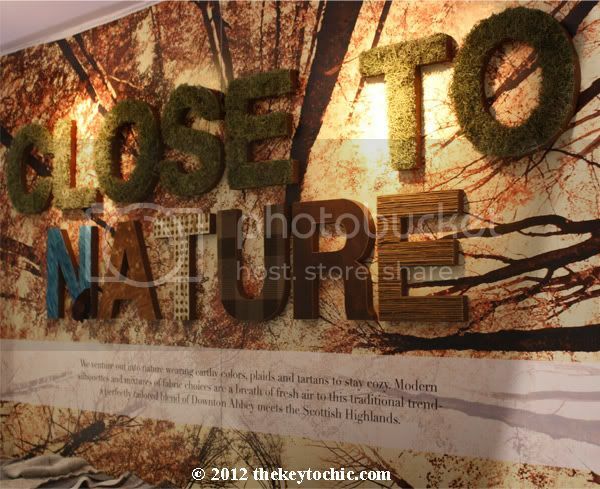 Close to Nature, the final trend, features earthy colors, plaids, and tartans in modern silhouettes with masculine attitudes. Think Downtown Abbey meets Scottish Highlands. It's a blend of four influences: military, nature, rider, and Scottish Highland. Lace, leather, tweed, and suede are important fabrics to the trend. ** For more photos of each trend, their color palettes, and color forecasts, please follow my Instagram account or my 2013-2014 Fashion Trends board on Pinterest and for more trend forecasts, click on over to the spring summer 2014 trend forecast. May not be reproduced or republished in any medium without written permission from thekeytochic.com.